Looking for a way to jump start your creative juices? 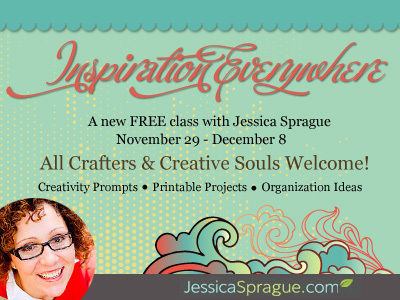 Hop on over to www.jessicasprague.com and check out her "Inspiration Everwhere" class. Every six months or so, Jessica likes to give back to the community which she says "has given me so much," by offering a FREE CLASS. Inspiration Everywhere is designed for ALL CRAFTERS & CREATIVE SOULS (scrapbookers and non-scrapbookers alike). Want to know more? Visit http://www.jessicasprague.com for additional details! Note: This is a shameless plug for my creative friend Jessica Sprague. I received nothing but warm fuzzies and happy thoughts for posting this information - just in case the FTC is watching and would like to know this!